Okay so I just realized my WordPress default is my parenting blog. Which for all the fans of my novel may or may not be your cup of tea, so if you started following my blog and meant to subscribe to my writing blog check it out at http://www.kaitlinbevis.com. Of course you’re welcome to follow me here and learn all about the love story brewing between chuck e cheese and the bird lady, but my feelings won’t be hurt if you switch. Thank you Michael, at my glass house, for the nomination. Tis award nomination comes with a few requirements. I have to answer questions… About me. For those of you who follow my other blog at http://www.kaitlinbevis.com, you know how I feel about talking about myself. Pink. Without any hesitation I say pink. It’s a great color. I love breast cancer awareness because it means I can own everything in pink. I love the color so much that I hoped against hope for a baby girl so I could buy her pink stuff. My prayers were answered, so her room is a sea of pink fluff. I love it. What’s my favorite animal? Cats. They just have such a sassy attitude. They’re sassy as all get out, yet they still manage to be both cute, and sleek, and dangerous, and lazy. I mean come on, what other animal gets so much diversity? Plus my nickname in high school was Kat or Kitty, so some partiality there. What is my favorite non-alcoholic beverage? Cherry coke, diet these days. I drink soda like it’s water. That’s going to be an issue some day I’m sure, but for now it’s delicious. Facebook or twitter? Facebook. I don’t get twitter. I have twitter accounts, but I’m still not a hundred percent on how it works. Favorite pattern? Erm? I like pink stuff…. I don’t do much pattern wise. Do you prefer giving or getting presents? Getting. I’m sure that will change when Bella gets older,but right now buying her something is kind of like buying me something, so I’m still giving to myself. Favorite number? 2. I have a thing for even numbers, and two is the first. I get two of everything if I have the opportunity. What’s my passion? Writing. Without a doubt. I love to write, and I’m so excited about the release of my book next week!!!! Michaels blog should really win. Other than that, Amy at fix it or deal. We spend a lot of time at Chuck E Cheese. We visit once a week for an hour before story time right when they open. We go then for two reasons. First, it’s way less crowded. Second, no one expects you to buy pizza or drinks that early in the morning, so I don’t feel guilty for being a cheapskate. We buy five dollars in tokens, and get the four square bonus check in, and Bella spends half her tokens on the carousel and spends the rest of the hour going from ride to ride. Then she dances with chuck e, and we go to story time. It’s a great way to spend the morning. But sadly this means that I know the plot line to the little chuck e cheese show on the stage. Yup, there’s actually a plot line. I mean not a complex one, just a mini story that’s consistently being added to that doesn’t go anywhere. Thats how I became aware of the tragedy that was the bird lady. She probably has a name, I don’t particularly care what it is. But the poor thing is in love with chuck e, and he could care less about her. He’s not leading her on or anything, he’s never said or done anything to indicate he was attracted to her. But when asking a machine or person or something that could predict the future she asked if she and chuck e would ever get together. And chuck e changed the topic really fast! 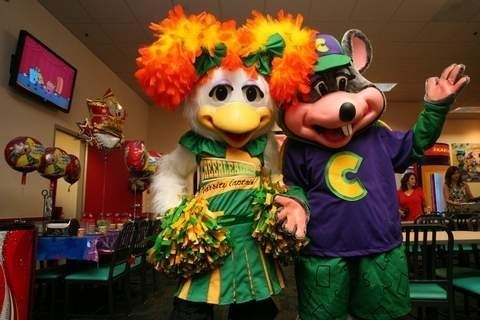 Then she sang him the Romeo and Juliet song, and asked chuck e, rather shyly if he could feel any love in the air. He stammered and flushed and changed the topic again! I mean come on! If he doesn’t like her like that, tell her so she can stop embarrassing herself. Why is the only female character in their whole cast embarrassing herself so much? It’s kind of offensive, and more than a little sad. So Bella has recently become obsessed with Diego. She carries baby jaguar around with her everywhere, and rescues toy animals around the house. She also now speaks jaguar. She sings entire songs in meows, it’s really cute most of the time. 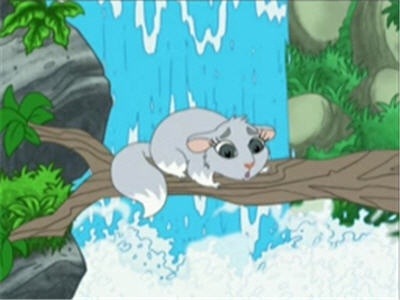 There’s this particular episode of Diego, Chinta the baby Chinchilla is stuck on the branch, and Diego says they have to save him because chinchillas don’t swim. It grates on my nerves every time, because seriously? Why is some ten year old kid risking his life, and a baby jaguar, which is high on the at risk species list for a baby chinchilla that chooses not to swim. So I have this theory about Dora the explorer. I think her parents are drug lords. I mean they have a really nice house, own a lot of property, and never seem to be at work. Not to mention the fact that they’re cool with their six year old daughter wandering ALONE through the jungle, befriending the local wild life. It makes sense. 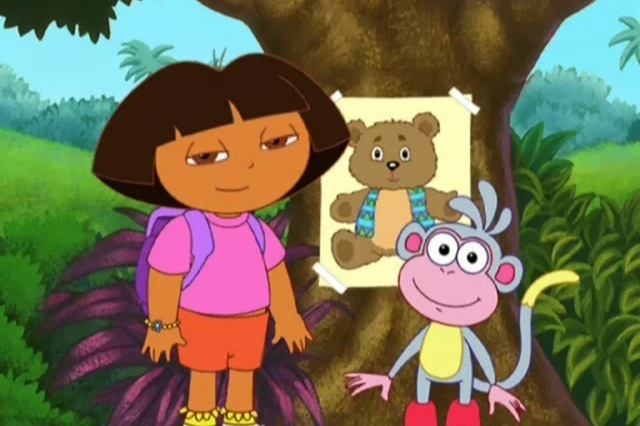 See, backpack, boots, and the map work with Dora’s parents to drop off the drugs in the right location. Poor Dora is oblivious to the whole arrangement, and probably thinks its normal to wander through the jungle to three random places a day, stopping briefly at each. Swiper is actually an undercover cop. He’s always trying to steal proof from Dora without tipping her off to the contents of her magical backpack (who one time actually had Dora search for a bag of sunshine). 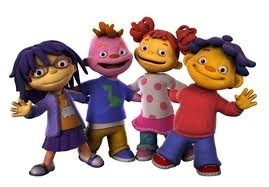 Unfortunately, at some point in the third season Dora must have accidentally begun to ingest the drugs. There’s an episode about Dora helping aliens, and then with the whole star catcher thing? The poor child has completely lost her grip on reality. Someone really ought to report her parents. Alice: Oh good Susie! Sid was just asking about how dark and light works. So, you’ll talk about that in class today too, right? Susie: You do know there are other children in my class, right? Seriously, we can’t keep doing this every day. They have questions they want investigated too. Sid: Gosh, Gabriella, haven’t you ever wondered about how sometimes it’s dark and sometimes it’s light? Sid: It’s so cool how sometimes it gets dark, right May? May: I like the darkness, it reminds me of my soul. Gerald: Yeah, yeah and sometimes there are animals in the dark! I’m a bad parent. My daughter watches tv. While she watches the shows I cook, and clean, do homework, and write. “Kat, when was the last time you cooked?” My husband wonders. Hmm… Okay, so I clean, and do homework, and write. Whatever. TV is bad for kids, no question, but so are unemployed parents, and septic shock. So, she watches tv. Since she’s a toddler, she enjoys watching the same show over and over and over. So I hear them over and over and over. After awhile I start reading into the shows WAY too much, and narrating with a very sarcastic voice in my head. 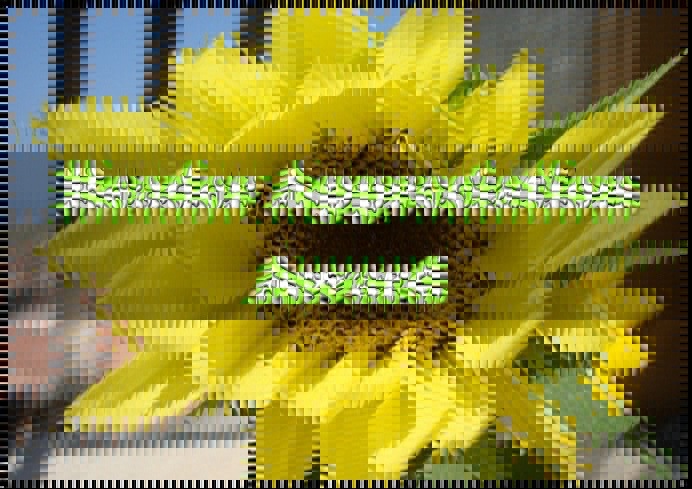 So why not use my blog as an outlet for this voice. Before I begin, I want to be perfectly clear. Despite anything I may say about any shows I blog about, I love them and recommend you buy them. My daughter has learned so much from these shows, and she gets endless joy from them. Today I had a particularly productive day because of the leapfrog show Numberland. Bella is sick, do she doesn’t want to do anything but cuddle up with her blanket and watch Numberland. Over and over and over. I also made cupcakes because it’s two of my friends birthdays. I wrote a scene for my book, did some edits, finished my homework, and interrupted Numberland long enough to take Bella on a run, ran some errands, and the list could go on forever. A very proactive day. In any case the soundtrack to my day was this movie. Numberland starts with a gopher destroying a garden. It knocks down all the signs and knocks over the seed basket. Violet and Scout come outside all ready to plant Mr. Rabbits garden. Where is Mr. Rabbit? No clue, he doesn’t make an appearance the whole movie. Nice set up, stick some signs in the ground and make the neighborhood kids do all your gardening. 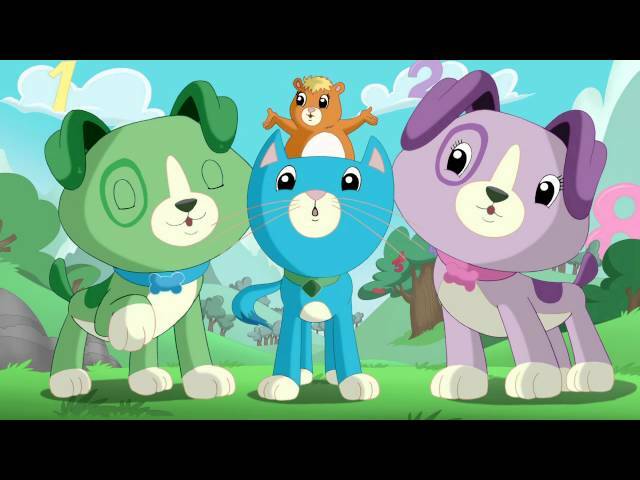 They’re soon joined by their friends Penny a hamster, and Eli a frady cat. The gang commiserate some more before Scout decides they should go to Numberland so they can learn to count and plant the garden. See they need to know how many seeds go in each hole so they can plant the garden. Violet: But Scout, your mental image of the garden showed all kinds of plants. All these seeds look the same. What does it matter how many seeds go in each hole if we don’t know which seed is which? Scout: *quickly takes Violet to the side* Shut up Violet, you know I’ve been dying to check out Numberland. Would you rather go have fun, or plant old man rabbits garden all day! Resolved, the group sets off in their magical self driving car through the cosmos. After going through some sort of weird time warp, they pop out in Numberland. Numbers are hanging in trees, floating in the sky, and painted into the background. Some of the numbers seem to be sentient beings. Confusing, but the animals don’t seem very surprised. While the group is exploring they strike up a conversation with a shady looking character on the side of the road. At this point I pause the DVD and have a long talk with my daughter about the dangers of hitchhiking. Unfortunately she’s two. So I think all she got out of it was “Look mommy, max the monkey ride in the car. Good friends. Max leads them to a broken down bus, and starts whining about how he can’t fix it. “We can help!” Penny says, volunteering the entire group. Number children pile off the bus and stare at their luggage in horror. Scout: Dude, we said we would help, not that we would sit around and chat all day. Let’s get to work guys! But even the most annoying song ever is cute when Bella sings it. The group finishes up, everyone thanks them, they get a picture taken and it looks Like the movie is coming to a close. But…. Scout: great! All done, let’s go explore! Penny: *talking to number children* What are you guys up to today? Whole group: Penny! douche jar! Violet intercepts: Hey you wanted to bring them! Scout: Fine! But that monkey is helping! Scout: See you’re doing that talking thing again when you should be working. The group helps set up for the party with more songs, and surprise! The party is for Max! Apparently the number children thought the best way for him to spend his party was to drive them to the park, and do manual labor. Scout: *seething* so not only did I not get to explore Numberland at all, this whole time because your bus broke down and you went nuts on the luggage, but I still didn’t explore this afternoon because I was setting up a party for you? Max: I tried to tell you it was my birthday like 50 times. The group returns home, and then tops off their day of helpfulness by planting a garden for the still missing Mr. Rabbit. To speed things up, they count by two. Penny gets pissed when she realizes the crops won’t grow instantly, but I think it’s for the best. They still never found a way to figure out which seeds are which, so who knows what kind of weird hybrids they’re going to get when the plants bloom. Mr. Rabbit is going to get pissed, but hey, maybe next time he won’t exploit child labor.